What do you do when you get to check off the item that was at the top of your bucket list? In recent years, that item was to get to hear civil rights leader Congressman John Lewis and get to shake his hand. 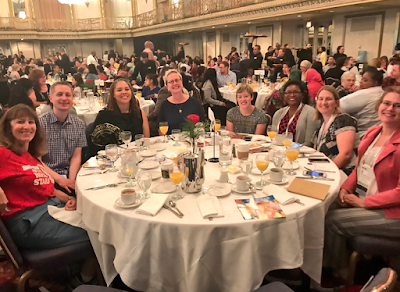 * Attending the Coretta Scott King breakfast thanks to Scholastic, and getting to hear Nicola Yoon, Jason Reynolds, and John Lewis speak, among many other amazing authors and illustrators. The CSK breakfast felt like I was attending an incredibly uplifting church service. If I ever get a chance to attend ALA again, I will be sure not to miss this experience ever again. * Going right from the Penguin party to a small, intimate dinner with Candlewick Press and middle grade author Mira Bartok, who wrote The Wonderling, a book that isn't even in bookstores yet and is already being made into a movie. *Meeting the illustrator of the March trilogy, Nate Powell, and learning many amazing insights into the life of John Lewis and the Civil Rights Movement. For more inspirational nuggets from ALA, check out my Storify archive.